The Flea Market at Eastern Market celebrated its 36th anniversary in 2019. The Flea Market, which boasted on its third year of operations that it had exhibitors from five states, has since hosted exhibitors from five continents! In order to make way for development of the site, on May 17, 2015, the flea moved its location off of the Hine Jr. High School Yard, on which it operated for 22 years. The market has moved to a closed-to-vehicle 7th Street SE, creating along with outdoor vending at Eastern Market, a 2 block street festival. We currently host up to 70 exhibitor spaces. Though not the largest flea market, it is arguably one of the most diverse in the nation. It was once voted second best in the world by a Huffington Post poll! The Flea Market features arts, crafts, antiques, collectibles, and imports from around the world. Exhibitors know what they’re selling. Many have actually made their products. The Flea Market has served as an incubator of many small businesses. Some have settled in the Flea Market neighborhood and another became a large chain of jewelry stores around the country: examples of the many of our exhibitors whohave gone on to grow their business into real brick and mortar enterprises. Many stores and mall kiosks that still prosper on Capitol Hill, in Adams Morgan and across the region, started as a stand on Sundays at Eastern Market. 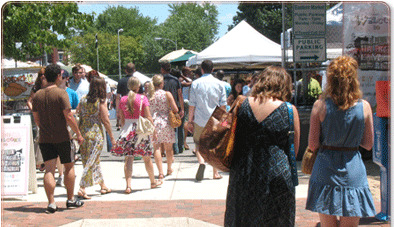 The Flea Market takes place 9:30 AM to 4:30 PM every Sunday, year round. It operates on 7th Street SEbetween C Street and Pennsylvania Avenue SE on Capitol Hill in Washington, DC. The location is ideal, sitting between the Eastern Market metro station on the south and historic Eastern Market itself on the north. Season Blossoms With Markets Across The DMV! Spring Blooms With Three Markets Opening in the DMV Region! Diverse Markets Management (DMM) is excited to announce the Spring and Summer 2019 schedule for its open-air markets. "For the first time in our 36-year history. we'll be managing markets not only in the District of Columbia and Virginia but also in Maryland, giving us a simultaneous presence in the whole DMV region," DMM President Michael Berman announced today. "Along with our long-standing Sunday Flea Market at Eastern Market and previously announced Farmers Market SW on Saturdays, we will now host opportunities for vending on 4 days out of the week, some weeks.